Father Charles Joseph Kraeszig, a diocesan priest who was granted early retirement for health reasons in 1975, died on May 10 in New Port Richey, Fla. He was 84. The Mass of Christian Burial was celebrated on June 8 at Good Shepherd Church in Indianapolis. Burial of his cremains followed at the Priests’ Circle at Calvary Cemetery in Indianapolis. Father Gerald Kirkhoff, pastor of Good Shepherd Parish as well as archdiocesan vicar for advocacy for priests and director of the archdiocesan Mission Office and Society for the Propagation of the Faith, was the principal celebrant for the funeral liturgy. He represented Bishop Christopher J. Coyne, apostolic administrator, and also was the homilist. 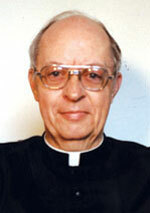 Father Kraeszig had suffered from fibromyalgia. “He was retired for 37 years,” Father Kirkhoff said. “During most of his 60 years [as a priest], his ministry was kind of quiet and subdued. It was a good example … to the people—his neighbors and other folks—in Florida. Charles Joseph Kraeszig was born to Edward L. and Francis Margaret (Elder) Kraeszig on Aug. 14, 1927, in Indianapolis and grew up in the former St. Catherine of Siena Parish in Indianapolis. After graduating from the former St. Catherine School, he studied at Saint Meinrad Archabbey’s minor and major seminaries for 12 years. He was ordained to the priesthood by Archbishop Paul C. Schulte on May 3, 1952, at the Church of Our Lady of Einsiedeln at Saint Meinrad Archabbey in St. Meinrad. His first ministry assignment on May 10, 1952, was as associate pastor of the former Assumption of the Blessed Virgin Mary Parish in Indianapolis. On May 18, 1954, Father Kraeszig was appointed associate pastor of St. Mary Parish in New Albany. His next ministry assignment on May 20, 1961, was as associate pastor of St. Augustine Parish in Leopold and two missions—the former St. Mary Chapel in Derby and former Sacred Heart of Jesus Chapel in Perry County. On Jan. 9, 1964, Father Kraeszig was named to his first pastorate at Holy Cross Parish in St. Croix, where he served until July 21, 1975, when he retired due to ill health and moved to New Port Richey, Fla.